Nick Skelton "A MASTER, AN OLYMPIAN, A LEGEND"
That was the caption written under the Instagram picture that Rodrigo Pessoa (the Brazilian Olympic gold medalist show jumper) posted on Instagram when Nick Skelton won the individual jumping gold medal at the Rio Olympics of 2016. It was a statement of fact from Rodrigo Pessoa rather than a compliment. 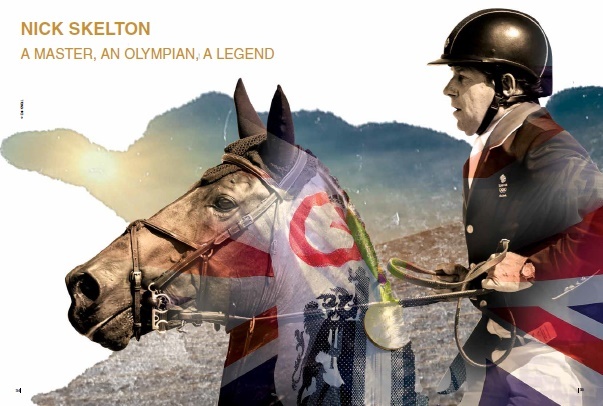 Nick Skelton is a true legend that was ending his life-long career with his greatest and most amazing success, an individual Olympic gold medal. For a career that has spanned decades the international show jumper Nick Skelton has been crowned 2016 Olympic individual show jumping gold medalist with his fantastic Dutch Warmblood stallion Big Star. Thinking that his horse might be a little rusty after all these years and himself being a little bit too old to win an Olympic gold medal, truly he made history and became Britain’s oldest gold medalist since 1908 with shooter Jerry Millner, who won gold in 1908 aged 61. “I`ve had a long, long career and to do it now is unbelievable to me,” Skelton declared. Competing in his seventh Olympic games, he was the oldest Olympic champion in Brazil. With a career that has spanned nearly four decades (38 years), and with decades of experience, the international show jumper Nick Skelton also had his ups and downs. These ups and downs can only be seen by looking through his legendary history, but a legend is not always a clean run but rather a road full of dust and scrapes that made this person a legend. His prestigious career which led him to win thousands of classes and hundreds of Grand Prix events and over £6.5m in prize money was as follows. Nick Skelton was born on 30 December 1957 in Bedworth, Warwickshire in England. He began riding at the age of 18 months (a year and a half), got his first pony called Oxo who was born in the same year Nick was born in. He left school early at the age of 16 years with no qualification; he then went to work full-time for Ted and Liz Edgars who were his trainers. Then he started riding Apollo. Together Nick and Apollo formed a partnership that won nearly all the top prizes in the sport. Nick Skelton holds the British equestrian high jump record, when he jumped over an incredible 2.32 meter fence on Lastic in London back in 1978 after two failures. His first Olympic Games was in 1988 in Seoul. Things started to get bad when Nick broke his neck in September 2000 which could have ended his show jumping career. “I hit the floor and heard a loud crack inside my head”. The doctors warned him not to ride horses again which could lead to a fatal end. He “retired” from the sport in 2001. He recovered from his neck injury and began competing again in 2002. His most disappointing moment was in the Athens Olympic Games of 2004 riding Apollo, where he was leading until the final round when he was eliminated. He was then honoured to receive his Officer of the Order of the British Empire (OBE) from Queen Elizabeth II. In 2012 in the Olympic Games in London, he won the Olympic Team gold medal with his fellow team members John Whitaker, Peter Charles, Ben Maher and Scott Brash. Some people might see show jumping as an individual sport consisting only of the rider. They might also think that team work is not present in it. But the fact is that in the Olympics the horse is considered an Olympic athlete as much as the rider is. This means that behind every successful rider there is a successful horse and behind Nick Skelton there is Big Star. The Dutch Warmblood Stallion has proven his name as “Big Star” after giving Nick Skelton all that he has in the Rio 2016, helping him to win the individual Gold Medal. Big Star is the son of Quick Star, a legend which was ranked third in the World Breeding Federation. Quick Star was the horse ridden by a talented rider Meredith Michaels Beerbaum. Big Star was foaled on the 1st of June in 2003, and was bred in the Netherlands. Big Star, the bay stallion, began his career at the highest level of show jumping at the age of 7 years. He was elected the KWPN (Dutch warmblood) of the year. Big Star’s bloodlines include the most influential sires of both the French and Dutch lines. This is what Nick Skelton says about him: “He`s an unbelievable character, he knows the occasion and he`s one of those horses who knows when it`s important and he can come up with goods”. He adds, “He is an absolutely amazing horse, you can trust him, he wants to do it, he has all the right attributes. He`s the best horse I`ve ever had or am ever likely to have.” Nick also mentioned him after his victory, “When you`re riding him you don`t worry about the courses too much, it`s all well within his capability. He`s not stretching or putting a lot of effort in…I knew if I didn’t make a mistake he will not…Big Star should have been on that podium too, without him I would have not been there…Somebody asked me who I dedicated that medal to and I said Big Star because he`s been amazing”. It wasn`t that easy at the beginning for Nick and Big Star to win the individual gold medal. As they came into the competition, it was not so good. In the 1st qualifier Nick and Big Star knocked down a fence. He was the 15th rider down the list but well worth the wait, for what followed was magnificent. Over bars, double and triple combinations Big Star was spectacular. Tossing his head and tucking in his forelegs over the fences with elegance showed how much he enjoyed winning. The result was near perfect and with a double clear Skelton was on top of the list. People waited to see who could match him and they bet on Steve Geurdat, the previous individual gold medalist. But unfortunately Steve couldn`t. Nick was first and he went for a clear with tremendous speed. He went for a medal, but which medal we don`t know yet. Then comes Peder Fredricson with a clear round but slower than Nick and he goes for a medal. And here comes the Legendary Eric Lamaze on Fine Lady 5. He is super-fast, faster than Nick but he has one problem: he is riding Fine Lady 5, he is not riding Hickstead. Fine Lady 5 is great but not as great and careful and legendary as Hickstead. He knocks down a pole, but with a speed faster than Nick. The whole world was talking about the tremendous victory. His eyes filling with tears, Nick Skelton got 615 messages on his phone after his victory. “He promised to reply to every message… “I suffer from really bad chronic pain so getting a leg up is painful…I have a metal hip on the left side so that doesn`t help either”, the veteran explained. Despite all that Nick Skelton achieved a dream by winning an individual gold medal. Another astonishing thing happened after his victory. Nick Skelton`s autobiography sales leaped after his gold medal. His autobiography “Only Falls and Horses” sold out after his win in Rio. Abebooks.com reported that his auto-biography was at its top search term the days following his win and that all copies are sold out. “The Rio 2016 appeared to have zero effect on bookselling until a 58-year-old from Warwickshire won a gold medal… Clearly there is an interest in his remarkable life and career”, says Abebooks`s Richard Davies. It is even weirder on Amazon where there is only one used copy for a stunning amount of 1,776.58 sterling. Unfortunately, he thinks that Tokyo 2020 would be out of reach for him. “I would be old…when Big Star stops, I stop”, he concluded. “It`s a technical job, you have to place the horse in the right position at the right speed with the right momentum. To get that right takes time, lots of practice and a good partnership”.The words of a Master, an Olympian and a Legend.